The offending update started rolling out yesterday, and it isn't a simple case of having sideloaded the wrong version. 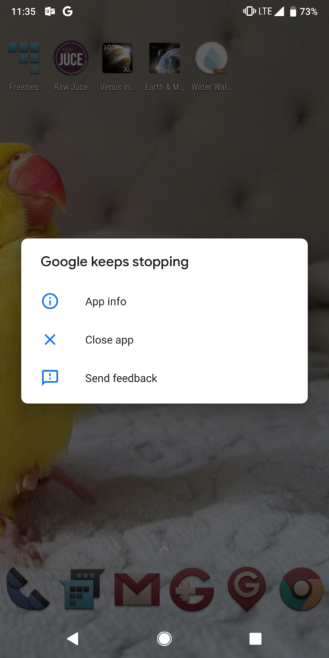 The issue manifests a repeated force close of the Google app, and reports seem to indicate that the problem is mostly affecting those on the latest Android P DP5 preview. 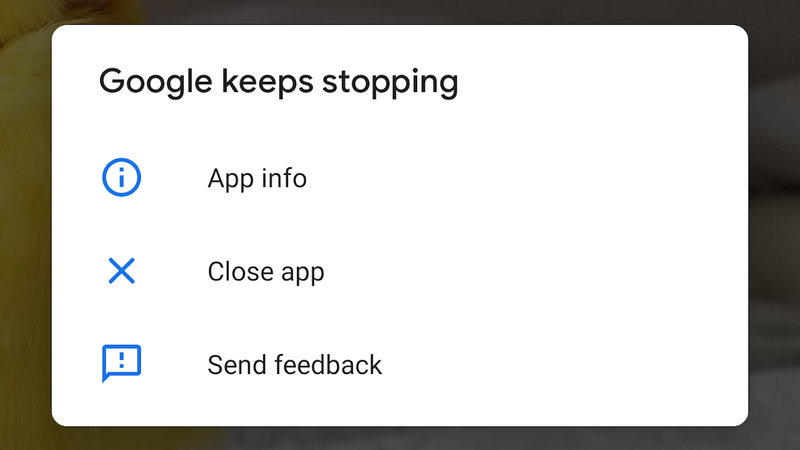 (Update: Turns out there's just a lot of overlap between groups, it isn't tied to Android P.) The dialog that appears when the app continues to crash as part of the issue is depicted just below. So far the only solution seems to be rolling back to the stable version of the app—available here thanks to those fine and exceptionally virile folks at APK Mirror (it's us). If you have opted into the beta, that means you'll have to either disable updates for the app for a short time or temporarily remove yourself from the beta until the issue is fixed. None of our own phones seem to be affected by this problem. There is some conjecture that the issue stems from being paired with a Wear OS watch, but even those of us using one haven't experienced it. Personally, the beta version of the app has been crashing for me on my Pixelbook, but none of my other devices are affected. Whatever is wrong with this particular version, it appears Google has pulled the update for the time being. I can confirm from a quick uninstall/reinstall from the Play Store that Google is now distributing an older version (v8.12.20.21, in my case). Based on a mix of reports from our comments and elsewhere, the issue may not have actually been tied to Android P. Turns out, there's just a lot of overlap between the sort of folks that beta test the Google app and those that run the developer previews, making it seem that there was a connection where there wasn't. Hardware running older versions of Android also seem to be affected, with reports for the problem ranging in variety from Pixels on Android O to Samsung's Note8. We've updated the body of this post to reflect this information. Either way, Google seems to be aware of the issue, and uninstalling Google app updates and reinstalling should now fix things without having to leave the beta. There's no need to micromanage your app updates to avoid this version.